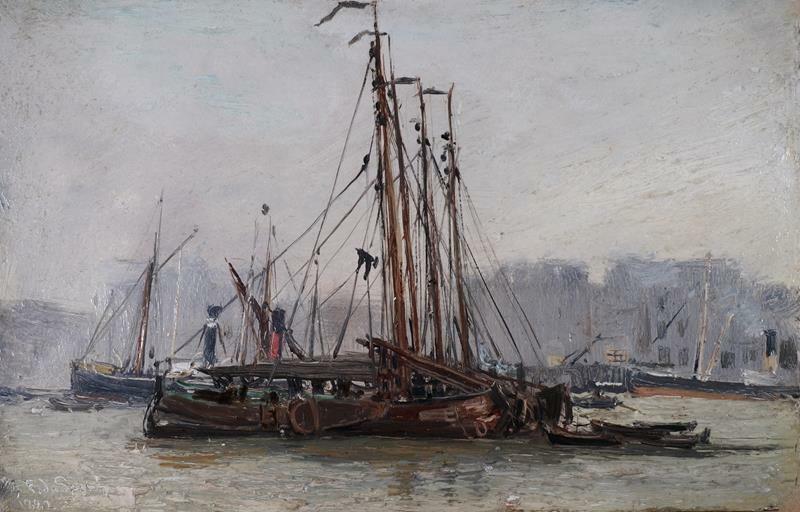 Barges & Steamers on the London Thames. 6 1/2 x 9 1/2 inches. French painter of seascapes, landscapes and architectural interiors. Frederic Sang lived in Kentish Town in London and painted mainly on the South Coast of England and in the Channel Islands. The art historian Denis Brooke-Hart described him as an artist of "exceptional talent" whose smaller sea pieces have a "loose style and mystic atmosphere" which is "enchanting". He exhibited some large canvasses at the Paris Salon and also exhibited in London at the Royal Academy and Royal Society of British Artists. His work is represented in the museum at Carpentras.